Resource Insights: Global oil exports in decline since 2006: What will importing nations do? Global oil exports in decline since 2006: What will importing nations do? It is with trepidation that independent petroleum geologist Jeffrey Brown has watched global oil exports decline since 2006. With all the controversy in the past several years over whether worldwide oil production can rise to quench the world's growing thirst for petroleum, almost no one thought to ask what was happening to the level of oil exports. And yet, each year a dwindling global pool of exports has been generating ever greater competition among importing nations and has become a largely unheralded force behind record high oil prices. Even though the trend in oil exports has been evident in the data for some time, the analyst community was caught by surprise when a Citigroup report released earlier this month forecast an end to oil exports in 2030 from Saudi Arabia, currently the world's largest oil exporter. Brown, as you might expect, wasn't surprised at all. His own forecasting model, which he calls the Export Land Model, has been predicting more or less the same thing for some time. He doesn't think the Saudis will actually let exports to go all the way to zero because they'll probably want at least some revenue from exports. But "one to two million barrels per day of exports [from Saudi Arabia] between 2030 and 2040 will not be a big deal in the world," said Brown, who runs a joint venture exploration program based in Ft. Worth. Brown estimates that worldwide net exports of petroleum liquids--a number that includes both crude oil and refined products such as gasoline and diesel--declined from 45.6 million barrels per day (mbpd) in 2006 to 43.7 mbpd in 2011. He uses the net exports number because importers such as the United States export some of their imported crude back into world markets in the form of refined products such as gasoline and diesel. Even so, the United States remains the world's largest net importer of petroleum products. The decline in global net exports may seem small for now. But it is persistent and comes in the face of growing demand among the rapidly expanding economies of Asia, particularly China and India. And the trendlines, if they were to continue, would mean that China and India alone would consume all the world's available petroleum exports by around 2030. Something's bound to give before then, but it's not clear exactly what. Brown focuses on a key number which he calls cumulative net exports (CNE). It's the total expected volume of exports from oil-exporting countries over the entire period from now until global exports are presumed to drop to zero around 2060. It's based on the trajectory established in the data from 2005 through 2011. Though the timetable is likely to change, when he looks at CNE alongside the current rate of decline for exports, it's clear that the world's remaining exports are "front-loaded." The largest portion will be delivered in the years immediately following the export peak. It's why "we've experienced something close to business as usual" since the apparent export peak in 2006, he said. In analyzing the production and export history of former oil-exporting countries, Brown has discovered a disconcerting pattern. "A rough, but fairly consistent rule of thumb is that [after an exporting country's oil production peaks] half of post-peak CNE tend to be shipped about one-third of the way into the net export decline period, which suggests that post-2005 global CNE would be about half gone around the year 2024," he explained. Think about this for a minute. Brown forecasts that half of all the oil exports that will ever be shipped from now on will have been shipped by 2024. That tells him that the economic pain associated with the loss of global exports is likely to become very acute in the not-too-distant future. If this happens, the world will be forced to adjust. But that adjustment is likely to be rather wrenching for some. Already, consumers in the United States, for instance, have actually partly accommodated rising demand in Asia by reducing U.S. consumption of oil products from 20.8 mbpd in 2005 to 18.8 mbpd in 2011. But the cutback has been largely a matter of necessity for those who have lost jobs or experienced wage cuts and for businesses which are struggling in a weak economy. 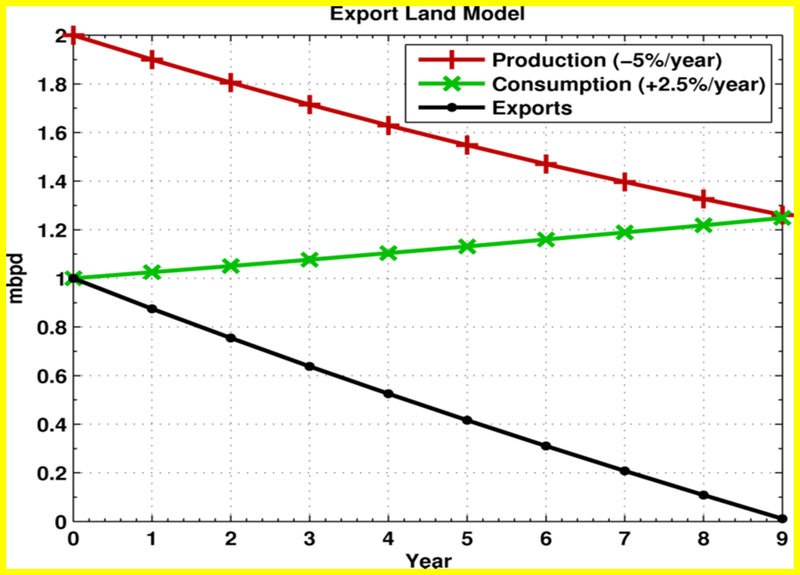 The two observations above led Brown to develop what he dubbed the Export Land Model. It was a simple model that seemed to explain a lot. Here's how he set up his first case: Brown assumed that a hypothetical oil exporter--which he designated as Export Land--had reached its peak in oil production. He assumed that domestic users in Export Land consumed half of all the oil the country produced. He then assumed a 5 percent annual decline in the rate of oil production and a 2.5 percent annual increase in domestic consumption. The results astonished and troubled him. 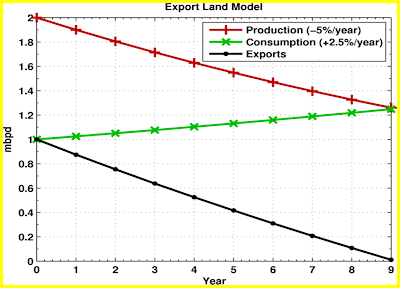 In just nine years oil exports from Export Land went to zero. He then tried the model out on two real world examples, the United Kingdom and Indonesia. Both countries were consuming about 50 to 60 percent of their own oil production at the time their production peaked, close to Brown's hypothetical case. But the U.K. had a higher production decline rate, -7.8 percent per year and a very modest 0.2 percent annual growth in oil consumption. Indonesia had a lower production decline rate than the hypothetical case, -3.9 percent, but a higher yearly increase in domestic oil consumption, 4.1 percent. Despite these differences, the results were quite similar to the hypothetical case. From its 1997 peak in oil production, Indonesia's net exports took only seven years to fall to zero. From the U.K.'s oil production peak in 2000, it took only six years for net exports to approach zero. After modelling these two real world examples, Brown and his colleague Sam Foucher began tracking petroleum exporting nations with more than 100,000 barrels per day of exports (based on 2005 data). These 33 countries represented 99 percent of the globe's net exports at the time. Strangely, no official energy agency calculates global net exports. So, Brown and Foucher have had to compile data from the U.S. Energy Information Administration, the statistical arm of the U.S. Department of Energy, and the BP Statistical Review of World Energy, a widely cited annual survey produced by oil giant BP. By the end of last year, three of the original 33 countries--Vietnam, Malaysia and Argentina--had dropped off the list and become net importers. Brown said importers around the world are already being forced to respond to an ongoing decline in net exports. "We are on our way to energy independence," he joked. "Just not in the way that we expected." The United States and other developed countries are now being outbid by the developing world for oil and ending up with a declining share of a declining supply of exports. "While the recent rise in U.S. production will help, it will not save us," he added. That's because the rise is too modest to put much of a dent in imports which have declined primarily because Americans have simply cut back their consumption of gasoline and other petroleum products in the face of high prices. Many of those who need less imports are also producing more of their own stuff(Brazil, U.S, etc). Another point is that Jeff Brown is using very few data points. For his extrapolation, he uses the 2002-2005 period, which saw an unreal amount of new oil being put to the market. If you take a longer, more reliable, 20 year time frame, you notice that we are only about 2-3 mb/d off trend by this year on crude oil production, and this doesn't include a recession. True, there has been a tightening, but NGPL's are(no matter how many try to avoid this) a legitimate source for certain oil replacements. Oil isn't only transportation fuel, in the U.S. more than 30 % of it's oil is now used for industry. In China, the figure is even higher. NGPL's have a legitimate role to play there. Another problem is the consumption growth. China is slowing down significantly, the same is true with India. Jeff Brown's analysis does not use this at all. So not only does he use very few data points to get an increase extrapolation trend in oil supply, he also takes the few data points which are the highest on oil consumption growth. Both demand and supply are therefore based on very few data points which are cherrypicked for maximum effect. The difference for supply is perhaps the biggest. If you take his extrapolation, you get almost 14 mb/d today. If you take the longer-run 20 year trend(instead of just 3 years as Brown prefers), you get about 3 mb/d. And again, net export math ignores growing domestic production in the U.S. and Brazil since oil-exporting countries are not going to grow their production by the same amount if they see rising U.S and Brazilian domestic production. And to add that, you have Iraq. I don't want to sound as if I am declaring Peak Oil 'dead'. It is not dead. But there's a lot of sloppy analysis out there. Brown isn't the worst offender(Campbell has predicted an imminent drop in oil production several times in the past 20 years and been wrong every time). But these kinds of things undermines trust in Peak Oil. We are still seeing a slow growth in oil production. It is very much about supply. But given the horizon, anyone who expects a sudden drop in production(net exports are limited in their own way, as I've outlined above) is going to be proved wrong. What matters is world oil consumption, net exports and net importers alike as well as global production. This does away with masking effects such as dropping U.S./Brazilian imports and rising domestic production. Now, in the 2017-2020 period, that is another story. You make some valid points, but then again no model is perfect. The mere fact that something is a model rather than the thing itself means that some factors have been left out. I think the contribution of the Export Land Model is that it provides a window into an issue that essentially no one had looked at before. So this is a first attempt, and it's been gradually refined and updated based on new data. Perhaps others will attempt to create another more comprehensive model. I admit and so does Brown that changes in consumption patterns by importers and growth among exporters will alter the current presumed trajectory. This is why he continually updates the data and the forecast. I think you overestimate what natural gas plant liquids can do to replace oil. Those liquids that can serve as oil replacements in transportation are limited in their usefulness by the ability of the current vehicle fleet to absorb them and also because they are only a fraction of production of any natural gas well. So, they are essentially limited by natural gas production and cannot be individually extracted. I'm not sure why you cite industrial use of oil as somehow a problem for the ELM. It still counts as oil consumption. You also mention that domestic production is growing in some importing nations, but you name only two. If you know of more, I'd be anxious to know about them because I can't think of any more. You neglect to mention that even though domestic production is growing in Brazil, consumption is growing even faster. Consumption minus production (i.e. imports) continues to grow. Brazil has become more dependent on oil imports since 2005 increasing them by 115,000 barrels per day through 2011 according to EIA data. You say that Brown must add Iraq, but Iraq is included in the model, so I'm not sure what you are getting at. If you mean that Iraq's production will grow to the huge number hoped for by the Iraqi government, I would say we ought to wait and see. So far, the country has not achieved its lofty projections. And, I don't think it's wise to make domestic energy policy based on what the Iraqi government says. As for a sudden drop in production, neither I nor Brown is predicting any such thing. I certainly don't think Colin Campbell has predicted any such thing. On the contrary many of his scenarios include plateaus going on for several years. But perhaps I've missed seeing some of his earlier projections. You and I do agree on one very important point. The main issue is total world production and consumption. Net exports is a special case within that framework, but it does have important implications for national security and market dynamics--which is why I thought it was important to cover. Thank you for your response, Mr. Cobb. Jeff Brown uses the 2002-2005 data source. As I've stated, if one takes the longer - and more reliable - 20 year trend, we are "only" off by 3 mb/d today. NGPL can not be used in a significant way in transportation in the short term, but that is not what I said. My point is that for industrial use, it can replace oil. Therefore the stagnation in crude oil production can be handled if more crude oil that was previously used for industry can be replaced by NGPL. Now, NGPLs are not perfect, and they have a lower energy content than crude, but they do play a role and as they increase, more and more crude can be shifted to areas of the petroleum consumption that isn't easily replaced(like transportation fuel). Another problem is that Jeff Brown uses only two countries for his reference case(I'm not talking about the 33 net exporters but the cases of the UK and Indonesia). This is very limited, and it's foolish to extrapolate onto the world what two single countries exerperienced. Another weakness is that he assumes very strong consumption growth in oil. The UK peaked in the year 2000, when oil was still cheap and thus consumption growth increased a lot more. Indonesia is still an inefficient economy. From 1965 to 2005 oil production growth, if one uses the BP database, grew by about 2.38% per year on average. So this is why I am not proclaiming Peak Oil dead. But these facts are not captured in his model, he uses a consumption growth pattern of 2.4%, which is far higher than it has been for over a half a decade now, and isn't likely to explode for reasons both you and I are aware of. Therefore, from his cherry-picked data sources(only three years), to cherry-picked countries, to outlandish consumption growth assumptions, the model is flawed from all sides. I am glad we both agree that the only thing that truly captures the health of the world oil situation is global production and consumption - net importers or net exporters alike. As for Cambell, yes, he has made several crazy predictions. He made one in the 1980s which was completely wrong. He has estimated a peak in 2006, but we haven't seen a peak, we've seen a slightly upwards plateau. Crude oil consumption is nearing 76 mb/d today, a significant step off from the 74 mb/d it got to in the mid-2000s. And even if it hadn't moved an inch, a peak is not a plateau and anyone who tries to claim otherwise is either ignorant or a charlatan. Campbell's co-author, Jean Lahèrre, has been far more careful, and in my opinion that has made his stature rise higher. He couldn't get to the last ASPO meeting in Vienna but I read his notes and he spoke frankly of the many issues I've outlined, as well as the tendency of many in the Peak Oil community to get tunnelvision and refuse to review their outlook when facts change or things don't quite pan out as they thought. Crude oil is the best we got, but it isn't the only we got. NGPL can and is increasingly used for industrial use and to ignore it's replacement value is to shut off your mind to arguments that does not already fit somobody's pre-conceived notions. As Keynes noted: "when the facts change, I change. What about you?". The doomsters have been wrong, time and again, and we will not see an imminent decline for the next few years. Does that mean that Peak Oil is dead? Far from it. I view Yergin and Maugeri as little else than con men. On a final note, I hope I've made my arguments clear on the issue of the ELM model, which is flawed in many significant ways, fatally flawed in some respects. I'd also like to note that I am engaging with you because I view you as informed, intelligent and reasonable. Even if you disagree with some of my points, I hope you re-consider some of my arguments, even if they upend some of your assumptions. I've tried to have the same approach with your arguments, you will be the judge of how successful I was at that.